Paw Print Genetics - Does your Brittany have recurring infections? Complement is a type of protein that plays an important role in the body’s immune system by attacking invading organisms such as bacteria. 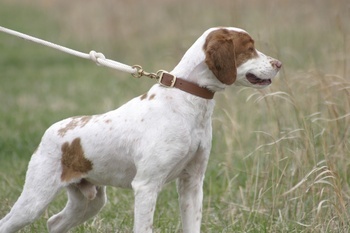 Complement 3 (C3) deficiency is a disorder of the immune system that affects the Brittany hunting dog. In this disorder, the complement protein is absent. Dogs with C3 deficiency may present with pneumonia and other reoccurring infections, excessive thirst and urination, weight loss, loss of appetite, mouth ulcers and depression. C3 deficient dogs may also develop kidney disease which can lead to kidney failure and death. Genetic testing of the C3 gene PRIOR to breeding in Brittany dogs will reliably determine whether a dog is a carrier of C3 deficiency. Carriers do not have any features of the disease but when bred with another dog that also is a carrier, there is a 25% risk to have affected pups. If the breeding pair has not been screened, prospective buyers should have the puppy screened PRIOR to purchasing to avoid this devastating disease. Paw Print Genetics can help you avoid this disease in your puppies and eliminate this gene from your breeding program.